"John Bowlby would be thrilled by this volume, which honors his memory by reviewing his theory of attachment in the light of today's advancements in basic developmental knowledge, clinical thinking, and newer methods of inquiry. An array of distinguished contributors present programmatic research and integrative perspectives in highly readable chapters. Attachment theory emerged from multidisciplinary psychoanalytic roots, from considerations of evolutionary biology, and from Bowlby's strong belief that multiple methods and approaches were necessary to advance our knowledge and development and its deviations. This book masterfully illustrates the correctness of Bowlby's view as attachment theory is applied, modified, and extended. Readers will experience the excitement of how a changing and useful theory of human relationships opens our eyes still further to new vistas. The latter will be an especially important grounding as we come to assimilate the anticipated knowledge explosion in genetics and the neurosciences." "After four decades of painstaking theoretical and empirical work, attachment theorists are now returning to the clinical roots of attachment theory. 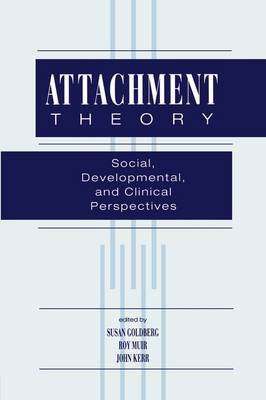 This is the basic message of Attachment Theory: Social, Developmental, and Clincal Perspectives, in which leading developmentalists, biologists, and clinicians discuss in great depth recent advances in attachment theory, with special emphasis on its clinical applications. The volume is uniquely broad in scope, offering new evidence and fresh insights into attachment across the life-cycle. In particular, the recent upsurge of studies of adult attachment provides a number of unexpected and exciting links to clinical diagnosis along with new avenues for pursuing the therapeutic process. A tribute to John Bowlby, who originated attachment theory, this impressively coherent, well-edited book succeeds in discussing issues of attachment, separation, and loss in an advanced yet nontechnical way. Helping to bridge the gap between basic research and clinical applications, it will serve as a standard reference work on attachment, and as a major source of inspiration to researchers and clinicians alike." "This book is a rare jewel, a multiauthored textbook that is must reading for any clinician or research investigator interested in a comprehensive review of the current field of attachment theory...Goldberg, Muir, and Kerr are to be congratulated on a work that was both marvelously conceived and wonderfully executed. Every professional working with children and infants needs to read this book. The scope of Bowlby's vision and Ainsworth's research deserve the full measure of recognition that this book imparts."